I’m probably a bit late to the party, but I only recently heard of Annabel Langbein. For those of you who haven’t heard of Annabel, she is a New Zealand celebrity cook and author a number of books including The Free Range Cook, Great Food for Busy Lives, Sensational Food Made Simple and Savour the Pacific which won the ‘Best Photography in the World’ award at the World Cookbook Awards in France, as well as a Ladle at the 2001 World Food Media Awards. I first came across Annabel in her Free Range Cook tv show, and the first thing that struck me, apart from the absolutely breathtaking New Zealand lake front location of her home (check out her Free Range Cook tv show and you will know what I mean! ), was her passion and enthusiasm for great food. Each episode you see Annabel foraging in her amazing garden and visiting local New Zealand producers for fresh produce that she incorporates into her delicious recipes. I love the idea of growing what you eat (if only we had a big enough garden to enable us to do that) and also utilising great fresh produce direct from the producers instead of supermarket shelves. It’s strange that years ago we used to do these things, but somehow lost our way and became reliant on supermarkets for all the food we eat. It’s wonderful to see a return to this way of life and eating. While we can’t all be lucky enough to have an amazing garden like Annabel, we can make the effort to purchase food from greengrocers or from farm co-operatives rather than supermarkets, especially in todays times where it seems supermarkets are the driving force in market prices and seem to pay farmers less and less for their amazing products. 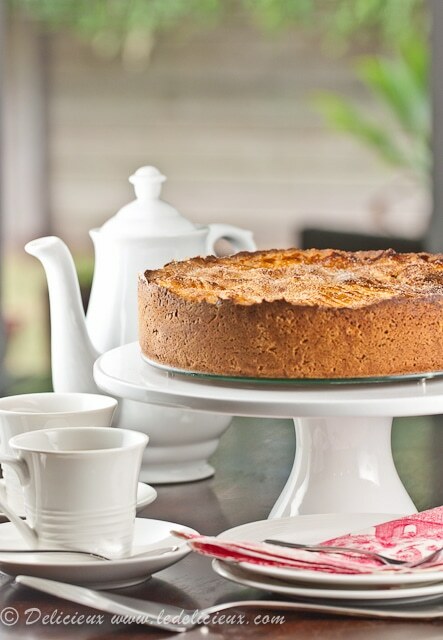 I saw this recipe for Apple Breton Cake on Annabel’s website and couldn’t wait to make it. My fiance is a huge fan of apple cakes and pastries, so I knew I just had to make this for him. To call this a cake though, in my mind, is a bit confusing because instead of a fluffy cake batter it’s actually a buttery pastry that surrounds the delicious apples encased inside. I think the best way to describe it is like a freeform apple pie. Whatever you call it though, it’s delicious, and was given a glowing endorsement by my 8 year old stepson who pronounced it “Double Yum!”. I don’t think you get a better endorsement than that from a child! Are you an Annabel Langbein fan? If so, what are your favourite recipes of Annabel’s? By the way, have you got your entry in for our 7 piece Scanpan Knife set compeition? The competition ends October 10 so click here to get your entry in for your chance to win this great prize valued at $160!! To make the base beat the butter and sugar together in an electric mixer fitted with a paddle attachment until light and fluffy. Add the vanilla and iced water and then beat in the egg yolks one at a time, beating well between each addition. Finally sift in the flour and stir through until just combined. Press 2/3 of the base into a 26cm springform tin covering the base and the sides. Roll out remaining pastry between 2 sheets of greaseproof paper and refrigerate both while you make the filling. To make the filling combine the apples, sugar, water, cinnamon and nutmeg in a large saucepan and place over a low heat and cook for 15 minutes, stirring frequently. Strain the apple mixture and set aside to cool completely. Preheat the oven to 180 Celsius (355 Fahrenheit) and remove the pastry from the refrigerator and sprinkle the ground almonds over the base which will help prevent the base from becoming too soggy. Pour the drained and cooled apples over the top and then top with the pastry lid. Press the edges of the pastry together to seal and then brush with the egg yolk glaze and sprinkle with extra sugar. Bake for 45 to 50 minutes, or until golden. Serve warm with freshly whipped cream. I used a mixture of Grannysmith and Sundowner apples. Thanks for sharing this recipe. I have had it bookmarked and on the list of going to try someday for over a year. I finally made it yesterday for a going away party. It was devoured. It was so buttery and flavorful. We loved it. So glad I got around to trying it. I’m pretty certian I will be making this again and again through out the years to come. Thanks! I love baking with apples and this cake looks simply divine! That cake looks amazing! I am bookmarking your recipe. Thanks Rosa 😀 Let me know how you go with the fritters. Have not heard of her, but this looks great. Reminds me of Far Breton I used to eat in France. That was made with prunes, but was delicious too. Great recipe! I was having a problem on what food I would share for our party and after seeing this blog I immediately thought that this is it, and I was right! Everyone loved it! Thanks for sharing. This looks absolutely gorgeous. I love the idea of growing everything you eat too…sadly I don’t have enough space in my little London flat, but our fabulous farmer’s markets are the next best thing! Amother apple fan here! Actually the whole family is! When I read the title, I did think that the first picture looked more like a pastry casing then cake as well! But the recipe sounds delicious- can’t go wrong with apples can you! This is making me feel like going to the kitchen and bake a cake and there are apples at home too! This looks so good! Bookmarking it! Thanks for sharing! 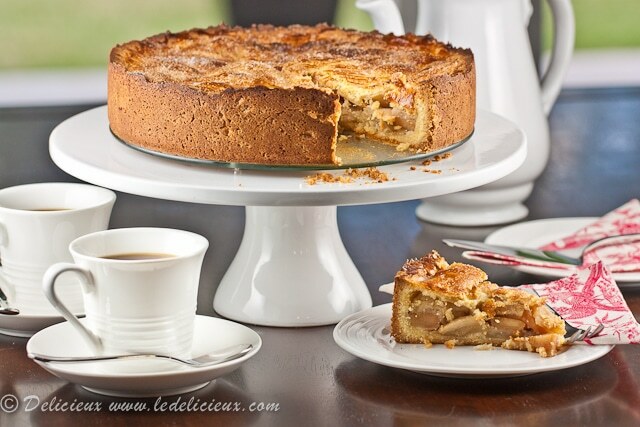 unusual take on apple pie/cake,love the look of it! Such a lovely cake! It reminds me of Jewish apple cake. I’ve never heard of Annabel Langbein (but I’m an American living in Israel so perhaps out of touch on New Zealand chefs 🙂 ) but I love the sound of her philosophy. Yeah shes great , love her books. 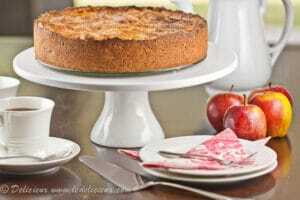 Your Apple Cake looks delicious. 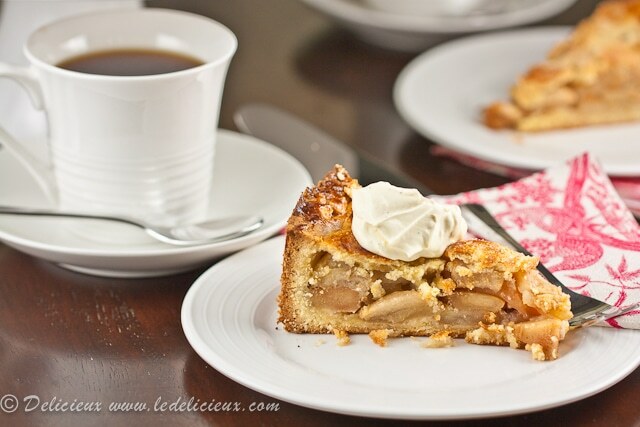 Apples are one of my favourite dessert/ cake ingredients too..